Just in: The minimum pool mark for prospective Australian skilled migration applicants who are looking forward to apply for the Skilled Migration Independent (Visa 189), has been increased. Ready to be implemented from 1st July 2018, the new financial year, now the minimum pass mark in order to be considered for Skilled Migration (Visa 189) has been increased to 65 points. This highly coveted news comes just days after the speculation regarding any possible visa changes was doing the rounds on social media networks. Previously, skilled visa applicants had to have a minimum of 60 points as their passing bench mark but now the threshold has been increased by a whopping 5 points. This new rule that is set to be implemented within just a couple of days i.e. 1st July 2018, may pose as a serious hurdle for those sitting at 60 points currently as it will be difficult to them to score now those added 5 points. It should also be noted here that until 30th June, 2018, the applicants can apply with minimum 60 points. But, with effect from 1st July, 2018, applications lodged on or after this date will now have to pass the cut-off criteria. It is imperative here to note that this new ruling is going to affect a large number of applicants. It should also be taken into consideration that as we have seen from the trends of the past SkillSelect invitation rounds, the cut-off scores have been following an uphill pattern with invitations now sent out to score holders of 75 points and above. So this new ruling means that there might be further increase in the cut-off points. Many applicants are now of the view point that it is not just about the case of meager 5 points, but in cases of many prospective applicants, 5 points means a lot. From now on, applicants will now have to look for ways in which they can boost their scores. In order to further gain assistance regarding how you can boost up your overall score and if you want free one-on-one consultations, Vision Consultants Australia (education agent, migration agent) can provide expert education and migration consultancy and visa services. Unparalleled service standards have given us an industry feat of best education agent and migration agent in Australia. Our team of MARA registered agents is always there to guide you. Travelling to Australia in near future? Find out whether your visa category needs Overseas Health Cover. Have a passion for Nursing? Find out below the prospects & requirements! What are the Top Occupations in New South Wales (NSW) – Read more! Do Australia New Visa Rules favor Single Applicants & those with Skilled Spouses? Great News: Two New Australian Regional Visas to be announced in Nov, 2019! Australian Federal Budget 2019 – What are its implications on skilled migration? 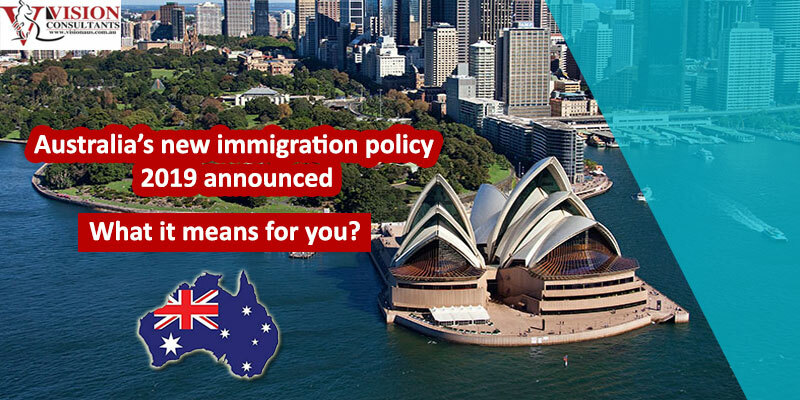 Australia’s new immigration policy 2019 announced – What it means for you?